Now’s your chance to join Patty in her #SomeNerve Challenge: training for the 2014 TD Five Boro Bike Tour. Check back here every month to read about her progress, follow her on Twitter @PattyChangAnker, and see what else she’s up to on her blog, Facing Forty Upside Down. This is her fourth entry. Click here to read her first. So far, learning to bike and training for the TD Five Boro Bike Tour with Bike New York has been series of surprising (and surprisingly fun) lessons (Learn to Ride, Bicycling Basics, How to Buy a Bike). Controlling my anxiety while pedaling (potholes! ice! people! dogs! toddlers! cars!) is something I never thought I’d be able to do, and now at age 43 learning to do it has led me to incredibly rewarding rides with Team #SomeNerve. As a beginner, overcoming the physical challenge of biking is one thing, but understanding the bike itself (how it works, how to maintain it and what to do if something goes wrong) is a whole other intimidating kettle of fish. I’ve never been a Fix It gal – I grew up in rental apartments where if something broke the response was to buzz the super. My husband’s the one who fiddles with bikes, cars, and pipes in the basement. If my car broke down I’d call AAA – what would I do if I got a flat tire on my bike? 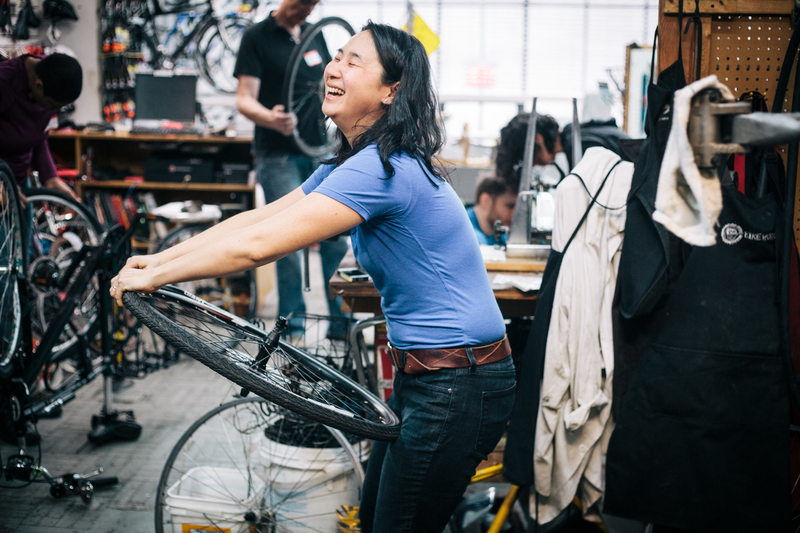 Bike New York’s Bike Maintenance 101 class has the answer to that and a whole lot more. I took the four-hour workshop (for $65 you get a patch kit, multi-tool, bike repair manual and your hands good and dirty) at Recycle-A-Bicycle in Brooklyn yesterday and came away with a much better understanding of how bikes work, how to keep them in good running order and how to tell if something needs adjustment or repair. Anatomy of a Bike – that “doohicky” I was so worried about turned out to be a brake cable. I replaced my vocabulary (“doohicky,” “thingy”, “out of whack,” “messed up,” “possessed”) with terms and phrases even grouchy bike mechanics would find acceptable (“My brake pads are worn,” “the derailleur isn’t shifting smoothly,” “the cable is frayed”). Breaking down has never been so fun! In a scene my husband never thought he would see, I learned how to pump my tires, and how to fix a flat. The class also went over how to adjust and repair brakes and fix problems with the derailleur, which gave me a better sense of what to look for to identify a problem but I don’t think I have confidence in my ability to fix them yet – I’d probably still take my bike in to a pro. But more than anything I gained a new appreciation for how beautifully simple and efficient bikes are in their design. I know what every little component on my Giant Escape 2W does, and that makes me feel much more confident about riding it. So confident that after the class I went for a ride in the rain. Priceless. Riding in the rain in Brooklyn Bridge Park! Click here to register for the next Bike Maintenance 101 class. OK, Patty. I am completely discounting the fact that you posted this on April 1st. I don’t think you are trying to fool me here. Looks like you are having some serious FUN getting up close and personal with your new “ride”. Keep on biking, Patty. You are doing great! All right Patty! Go for it! I am so proud of you! Thanks so much Michele! Your encouragement means a lot! Patty, I just got hip to your blog, and this is SO cool!!! I actually loved riding as a kid, but “grew out of it”, and then started again in 1992 at the age of 37 – and i haven’t stopped since. I’m a grandfather who commutes to work by bike (we live in Boston) as often as possible, April-November. And while I won’t be on the Tour this year, I participated from 2009-2013. You will LOVE it – really, just a GREAT way to see New York City. Good luck!! !